Carson Optical tripods are low-cost aluminum models with lever locks and geared center columns on the three tall models and a rapid center column on the small tripod. All have video style heads with quick release plates. 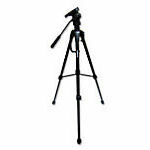 Carson Optical TriForce Tripods are lightweight aluminum tripods ranging from 20.7" to 65" in maximum height. All have flip-lever leg locks. Other features vary from model to model.